There are no frills about this cake. The goal was to create the absolutely best tasting piece of chocolate cake. I used Toba Garrett’s chocolate fudge cake recipe, which bakes up really dense and flavorful, much like a brownie. It has become a family favorite. 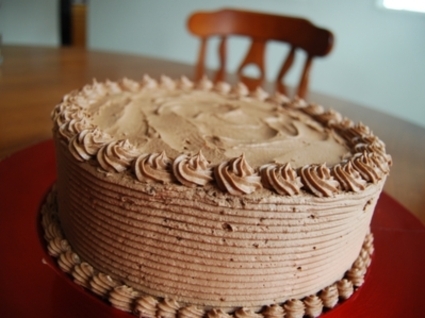 The frosting is basic buttercream enhanced with lots and lots of cocoa powder. - I always measure the gram weights instead of using cups. The results are much more consistent. - The batter makes two very tall 9″ round cakes. I am often able to make an additional small layer of cake from this recipe. - If you flip the cake too warm, this cake will condense and have the texture of a flowerless cake. This can be a good thing!